Introducing Brides of Houston Magazine! Welcome, welcome to the Brides of Houston website! What an amazing journey to Houston it’s been, and we are literally counting down the months until we unveil Brides of Houston magazine in August 2018. We can’t wait to share this 100% local wedding resource with Houston brides and wedding enthusiasts! Every company has a story and we’re excited to share our history to acquaint our audience a bit more with what we do and how Brides of Houston came to be. Kami Huddleston and Ashley Bowen Murphy, publishers, first started Brides of Oklahoma in 2007 with the dream of giving Oklahoma brides the ultimate wedding resource that showcased a collection of the absolute best Oklahoma weddings and that easily connected brides with the most creative local wedding artists, vendors and venues in the marketplace via a multimedia approach inclusive of print, web, blog and social channels. After years of pouring their hearts into the Oklahoma wedding industry, they expanded to the booming Dallas-Fort Worth area and launched Brides of North Texas in 2009 which has become the go-to print and online luxury wedding resource catering to brides planning DFW weddings, featuring an unprecedented number of gorgeous weddings from across the region and the creme de la creme in the local wedding industry through carefully-crafted editorial features. Our mag family grew once more as Brides of Austin debuted it’s first issue in September 2015. The talent and creativity in Austin weddings only solidified our desire to complete the Texas picture with Brides of Houston. Over time, so many breathtaking weddings from across the HTX are have crossed our desks, and we’ve become totally enthralled with the unbelievably talented creatives in the market who make these dreamy weddings come to life every single weekend. As the fourth most-populous city in the United States, boasting an ever-growing wedding community, we could not be more thrilled to bring such a tremendous resource to the Houston wedding scene. We’re so grateful for the connections we’ve made with so many of Houston’s best wedding professionals and can’t wait to work alongside each of them to bring to life this phenomenal wedding resource that will be invaluable to brides planning Houston weddings. As you browse through the website, you’ll find inspiring posts and images from Houston weddings, access to the absolute best Houston wedding vendors, a nearly infinite amount of Houston wedding inspiration, along with a guide to Houston wedding events, sales and promotions that you won’t want to miss! The website is fully responsive making it easy to navigate whether you’re on a mobile or tablet device or laptop or desktop computer. We’ll continue to share our favorite parts of the new website in the coming months, but for now we hope that you enjoy perusing through the pages. 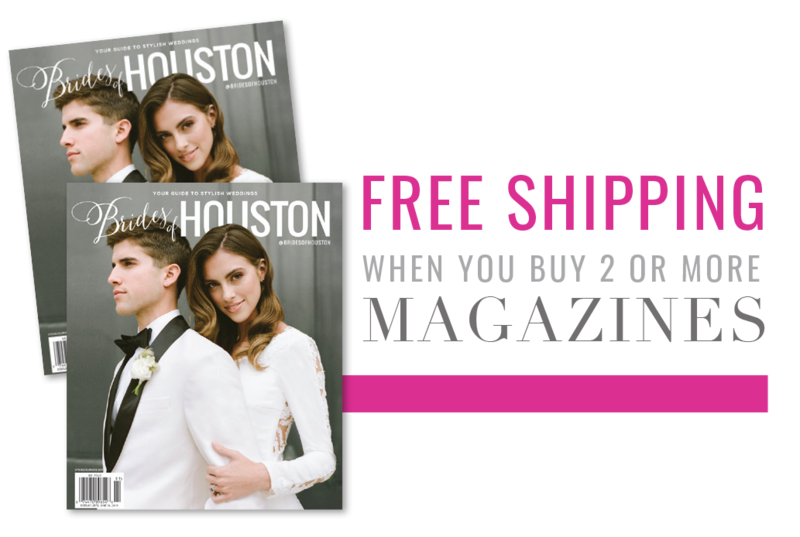 And, if you haven’t already, be sure to subscribe via email with us by entering your email at the bottom of this page and you’ll be an official Brides of Houston insider and begin receiving our daily posts, exclusive offers and so much more direct to your inbox! Mark your calendars, friends! The inaugural issue of Brides of Houston magazine will hit newsstands this coming August and until then, we’ll be working hand-in-hand with talented Houston wedding pros to pull together truly inspiring editorials to share with Houston brides! Be sure to follow us on Instagram, Twitter, Pinterest and Facebook to stay in the loop and follow along with us on this exciting journey! Cheers!